Sometimes your training will hit a wall and that’s not such big of a deal – your muscles simply have to be targeted with some new stimuli from time to time. With a smart change in the routine, range of reps, targeted area or weight, new growth will be just around the corner. But while you’re at it, why not incorporate some pro tips in your new routine and watch your gains go through the roof? A number of top bodybuilders have been more than willing to reveal their award-winning methods and techniques about stimulating maximum growth. So make sure your motivation is at the right level and challenge yourself beyond the edge by following in the footsteps of giants like Jay Cutler, Victor Martinez, Ronnie Coleman, Chris Cormier, Johnnie Jackson, Melvin Anthony and Darrem Charles. We hope you’re mentally prepared to bring your game to the next level, because these workouts are designed for nothing less than top results. Welcome to the backstage of bodybuilding’s Herculean league! IFBB pro Jay Cutler’s method for building huge and powerful muscles revolves around the rest-pause principle. He avoids performing continuous repetitions at a steady pace and instead makes two-count pauses to give his muscles an intense squeeze at the top or bottom portion of the movement. Maintaining balance and control while focusing the weight on the targeted muscle is a priority for this legendary bodybuilder. But just like Coleman, he also states that with many exercises, more muscle groups have to work as one to allow for optimal contraction and full range of motion. The Dominican pro bodybuilder Victor Martinez likes to hit his muscles with strict, high-intensity reps for maximum impact, making sure the focal-point muscle gets all the workload. During his early years, the jacked IFBB star had a lot of trouble developing his arms, which were his greatest weakness. He states he was training them twice a week for a long period of time with no substantial results before becoming frustrated enough to actually reduce his efforts to one arm workout every two weeks. And that’s when he first experienced real growth. So when it comes to building massive arms, his advice is rather simple: don’t overtrain. Keep in mind that your arms already get a piece of the action during your chest, back and shoulder workouts, so don’t push it too far with excessive isolation work on top of that. Rest and recovery is crucial for growth. The eight-time winner of the Mr. Olympia title stresses the importance of using explosive power and strict execution on every single rep. Instead of opting for lighter weight and focusing on the contraction, Coleman prefers forcing his muscles to work to their full capacity with as much weight as possible, while maintaining a perfect form. 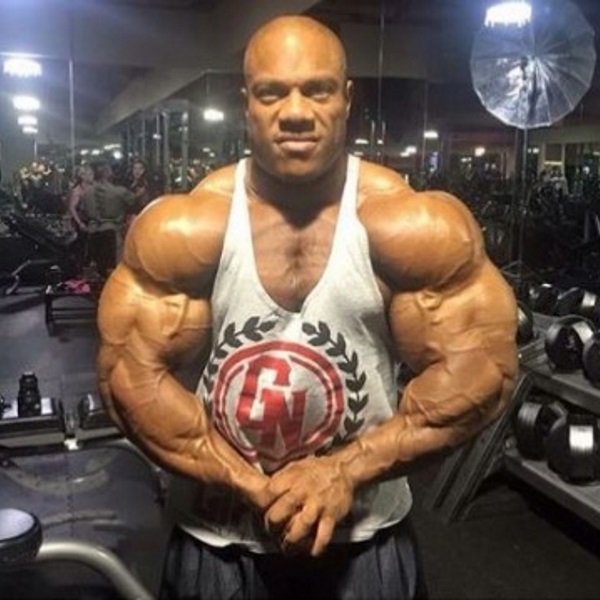 As an IFBB pro with almost unmatched competitive experience, Chris Cormier used his own approach when training to get huge: an optimal blend of power and strictness. When performing his reps, he doesn’t worry about reaching a certain number – instead, he focuses on getting the most of the muscle by thoroughly stressing it throughout its full range of motion. On the subject of training arms, he emphasizes the importance of letting your arms extend all the way down, then contracting them all the way up, using an adequately heavy weight. And when it comes to the dreaded leg day, this bodybuilder with notoriously ripped legs calls for maximum pressure and a balanced involvement of both primary and secondary working muscles for optimal results. Johnnie Jackson is known as one of the strongest bodybuilders in the world, known for competing at powerlifting events and rocking a godlike physique. His method for stimulating insane growth is distributing the workload over an entire muscle group, instead of focusing it on one single muscle in that group. When training, he uses weight so heavy that it cannot be managed by contracting only one muscle – the neighboring fibers have to lend a hand. “The more muscles that have to be called into play, the more mass you will gain“, explains Jackson. Top level bodybuilder Melvin Anthony is widely known as the best poser of the modern bodybuilding era, relying on perfect symmetry and muscle separation to create an incredible aesthetic effect on stage. In addition, he often gets credit for having the best developed back musculature in the world. Anthony’s muscle-building tactic is based on maintaining continuous tension in the muscle in terms of controlled movements. He would go down slowly, then power himself up, focusing on the contraction and avoiding a jerky up and down motion. No matter the exercise, Anthony insists on using strict form until reaching failure, after which he squeezes out some additional partial reps. His key advice for ultimate success is to keep the muscle under maximum tension all throughout the movement. IFBB champion Darrem Charles’s impressive competition history speaks volumes about his meticulous training regime. His cheating, in terms of applying force from a muscle group other than the targeted one is down to the minimum – just enough to perform a given exercise correctly. Other than that, he advocates using weight that’s heavy enough to activate the secondary working muscles to support the lift, which in turn allows the primary muscle to achieve full contraction and places even more stress on it. But moderation is the key here – if the weight is too heavy, your goals will be compromised. Note: These workouts are done by the pro bodybuilders. They could be too much for the average gym goer. Make sure you have enough experience and good conditioning before attempting them.